The new law on access to public information pushes local authorities throughout Ukraine to create the conditions within which citizens can fully exercise their rights. However, today the majority of small city councils still lack the highly-skilled professionals and technical equipment necessary to put the new legislation in practice. 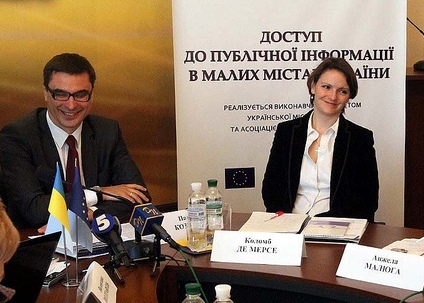 To respond to these challenges, a new project, “Access to Public Information in Small Cities of Ukraine,” was launched on April 23 in Ukrainka, Kyiv region. The European Union pledged 90% of the €150,000 initiative. The Executive Committee of the Ukrainka City Council and the Association of Small Towns of Ukraine will contribute the remaining 10%. The project’s opening conference served as a good platform to outline the main goals of the project and to issue a call for applications inviting local self-government bodies to take part in project’s implementation. 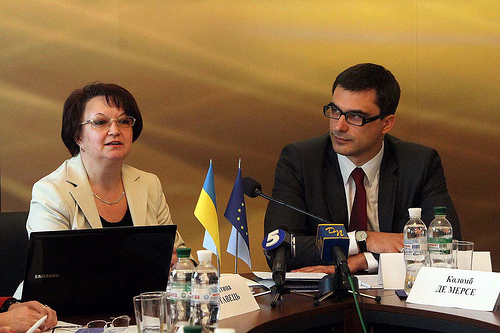 Colombe de Mercey, EU Delegation sector manager for civil society and media, recalled that while the European Union is actively engaged in political dialogue with Ukraine, it also offers Ukraine a broad reform support programme with the aim of bolstering the country’s efforts to promote democracy, development and stability. In this regard, the project demonstrates EU commitment to a strengthened co-operation with Ukraine and its citizens, de Mercey stressed. According to Valentyna Poltavets, the project coordinator, the initiative will support 20 small cities ready to commit themselves to promoting best practices around access to public information. One of the objectives of the project is to develop regulations around using the new law with the involvement of both local authorities and general public. The project beneficiaries will benefit from relevant expertise, and gain new skills through special workshops focused on the enforcement of the public information law. Poltavets believes this transfer of knowledge and skills will contribute to effective follow-up activities by local government authorities. Angela Maliuga, head of the secretariat of Verkhovna Rada Committee on State Building and Local Self-governance, admitted that the project is pursuing an ambitious goal. She emphasised that the Committee will be fully engaged in all project-related events and will consider the possibility of using the results of the initiative to further improve the public information law. With a budget of €150,000, the “Access to Public Information in Small Cities of Ukraine” project aims at improving capacity building among local government bodies to deal with the challenges and opportunities created by the law on access to public information. The initiative is co-funded by the EU and run jointly by the Executive Committee of the Ukrainka City Council and the Association of Small Towns of Ukraine. The project will create the ideal conditions for public information access through advanced information technologies in municipal administration. It will strengthen the capacity of local small town governments in the area of municipal services and access to public information. It will also disseminate the positive experience of participant cities to other parts of the country.